I began putting some of my thoughts down on paper and wanted to share them with you. To find out about True Friends, read below. Enjoy…..
games and then you go home. You play on teams together, you laugh together you cry together. It’s a never ending chain. field and off the field. A real softball friend is there to help you with your bumps and bruises. The earliest known softball game was played in Chicago, Illinois on Thanksgiving Day, 1887. It took place in the Farragut Boat Club at a gathering to hear the outcome of Yale and Harvard football game. When the score was announced and bets were settled, a Yale alumnus threw a boxing glove at a Harvard supporter. Another person grabbed a stick and swung at it. George Hancock called out “Play ball” and the game began, with the boxing glove tightened into a ball, a broom handle serving as a bat. The first contest ended with a score of 41-40. The ball, being soft, was fielded barehanded and thus, the game became softball. Playing nine tournaments a year can be an expensive ordeal. Each member contributes $275, FEDERAL ENVELOPE of CHICAGO paid for new uniforms. The team's hunt for it's first SPA WORLD TITLE even looked in the early going at COLUMBUS that maybe it would take another year to win a championship. The GEEZERS who have played at .500 pace (9-9) the past two years started off the same way they have played in that span, as a .500 team. However, good things sometimes come to those who wait and such was the case for the GEEZERS. The GEEZERS continued their run through the loser's bracket beating PROHEALTH CARE 24-16 in the loser's bracket finals to earn a shot at number one seed and undefeated JERSEY JAGS. “We were tied at 21-21 in the bottom of the seventh against the JAGS, when JAY AVERY delivered a bases loaded two-out single to force the “if” game,” DOELL said. The GEEZERS finished off their five-game consecutive winning streak with a 22-15 win over the JAGS in the title game and earning them that long awaited first-ever SPA WORLD title. The team also took home a number of individual honors highlighted by DOELL being chosen as the TOURNAMENT'S MVP. He earned the award with sparkling defensive play in left center field and a .786 batting average and a team high five home runs. Others earning spots on the ALL AMERICAN team were MATT BARONE (1b, .750), TOM BRIGLIO (LF, .697), PAUL DAILEY (RF, .667), JIM DEDELOW (2B, .636) and JERRY HANDEL (C, .533). Others on the team were AVERY (2B,.824), FRED GRUNINGER (C,.786), TONY GURDAK (RCF, .559), RAY HAFERTEPE (3B, .697), HARVEY KOST (P,.700), JESSE MANUEL (RC, .774), JACK MILLER (P, .594) and MICKEY MILLS (SS,.774). Also coming in for special recognition were BARONE, who served as the team's assistant manager and the team scorers, MYRNA MILLER and JUDY HAFERTEPE. Although DOELL loved the COLUMBUS WORLDS and especially the astroturf fields, he still has a soft spot in his heart for DALTON. Now with a WORLD TITLE under their belt, the GEEZERS main concern is where can they play next year. COLUMBUS, OHIO – TWENTY-TWO 75 and 80 AAA teams along with the 75 MAJOR DIVISION surprised even SPA EXECUTIVE DIRECTOR RIDGE HOOKS with the turnout for the SPA WORLDS at COLUMBUS, OHIO'S BERLINER PARK AUGUST 11-14. The total of 22 teams may not sound like a big deal but when you consider how many teams actually are in those divisions it is amazing. SPA has 23 registered 75 AAA TEAMS which means 56-percent (13 teams) attended the tournament. It was even higher for the 80's as 5 of 7 (71-percent) made the trip to COLUMBUS while 4 of the 9 registered 75 MAJORS participated. The attendance was also spread among 15 states, so the attendance was definitely not regional as teams from INDIANA, MICHIGAN, ARKANSAS, NEW YORK, KANSAS, ILLINOIS. NEW JERSEY, WISCONSIN, TEXAS, OHIO, MINNESOTA, GEORGIA, MARYLAND, KENTUCKY and PENNSYLVANIA attended. Four DIVISION champs were crowned with WISCONSIN'S PROHEALTH CARE 80's going undefeated in bracket play, ending it up with a 21-15 win over the TEXAS CLASSICS finals to win the 80 AAA crown. Others in the bracket were SOUTHWEST STARS, COSSA 80'S and JIMMY”S MINNESOTA LEGENDS. In the four-team 75 MAJOR group, the LEFTOVERS claimed the title with a 23-8 win over HAMEL'S 75's in the championship game. The LEFTOVERS also defeated JIMMY'S MINNESOTA GOLD 27-12 and HAMELS 75's in an earlier game 21-20. CANTERBURY CRUISERS was the fourth team in the field. PEACH TREE RESTAURANT took no prisoners in rolling through the seven-team 75 AAA SILVER bracket. The PENNSYLVANIA team beat LOUISVILLE THUNDER 27-13, INDIANA SILVER FOXES 32-9, INDY CROWNS 15-0 and LOUISVILLE THUNDER 14-8 in the championship game. Others in the group were COSSA 75'S, MICHIGAN LAKERS and NAMI CONSTRUCTION. The CHICAGO GEEZERS lost their first game in bracket play 13-8 to the ANTIQUES and had to come out of the loser's bracket winning five in-a-row to take home the 75 AAA GOLD top prize. Along the way the GEEZERS beat HARRIS AUCTION28-23, NY STATESMEN 30-29, PROHEALTH 75'S 24-16, JERSEY JAGS 22-21 and the JAGS again, this time in the :IF” game 22-15. The SPA office also took a survey among the managers dealing with 2015 age rules, tournament locations, etc. and the results will be released as soon as they are compiled. MUSTANG, OK - For 75 and 80 teams it has become a "no brainer", if you want to play tournaments where you will find other 75 and 80 teams you play the SPA MID-WEST and MID-EAST CIRCUIT. That was verified again in 2014 when five SPA TOURNAMENTS again proved to be the top draw east of VEGAS in all SENIOR TOURNAMENTS hosting 75 and 80 Division teams. "Over the past six years we have seen the attendance at just our WORLD CHAMPIONSHIPS for 75 and 80 quadruple in attendance," SPA EXECUTIVE DIRECTOR RIDGE HOOKS said, "This year alone we are expecting 22 teams (13 75 AAA, 4 75M, 5 80'S) in that age group. That is expecting not projecting." The high attendance figure is not only in the SPA WORLDS. THEE BUCKEYE CLASSIC drew fifteen 75's and three 80's to the JUNE BARBERTON,OHIO tournament while the JUNE COLUMBUS,OHIO HEART OF OHIO tournament has six 75's. SHELBYVILLE, INDIANA'S JULY HOOSIER CLASSIC pulled in seven 75's while GLEN BURNIE, MARYLAND had five 75's. That may not soul like many teams but when you are a 75 or 80 team it is a breath of fresh air. 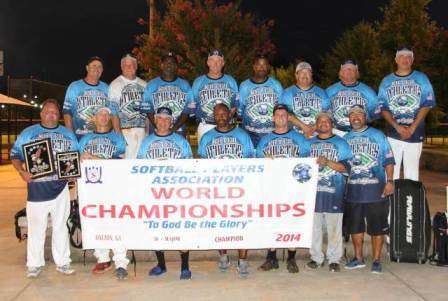 "We just got back from the SSUSA MID-WEST NATIONALS in Kansas and we had to play 70's teams," TOM NORMAN, manager of the TEXAS CLASSIC'S 80's said, "It isn't much fun playing teams 10-to-15 years younger than you." What the TEXAS CLASSICS experienced is not an exception but more like the norm. Out of all the SSUSA and ISSA tournaments east of VEGAS this year only one had three or more 75/80 teams entered. "The 75 Division teams all know, if you want to play in a tournament where you see a lot of different 75's teams you have to play SPA and mainly in the mid-west," BILL REGAN, manager of PENNSYLVANIA'SPEACHTREE RESTAURANT team said," "You would hope the other organizations would try to put on a few "75/80 division friendly" tournaments together but that hasn't happened." These aren't just local teams making the trip to the mid-west tournaments for 75's and 80's, they are coming from KANSAS, TEXAS, MINNESOTA, WISCONSIN, NEW JERSEY, NEW YORK, MARYLAND, GEORGIA, INDIANA, ILLINOIS, KENTUCKY, MICHIGAN, PENNSYLVANIA and the CAROLINA's. "You go where the other teams go and right now they are playing in INDIANA and OHIO," BOB NAMI, managerof NEW JERSEY'S NAMI CONSTRUCTION said, "I don't know what their (SPA) secret is but they sure turn out the 75 and 80 teams at their tournaments." JACK HAYDEN of the 75's LOUISVILLE THUNDER said it best. "Teams have to decide if they want to pay $450 to go to a tournament a hundred miles away and play 70's teams and/or one 75 team or pay the same price and travel 400 miles and play different teams in their own age class," HAYDEN asked. "We prefer to go those extra miles and play lots of different teams in our own age group." Another manager said, "If we are going to travel a hundred miles or more to play in a tournament and there is only one other 75 team, we would be better off staying home and inviting that other team to visit us and play a few games over a week-end and both can save the $400 entry fee." So this winter when you start planning where to play in 2015 be sure and put the SPA MID-WEST tournaments on your list, especially if you want to play 75's and 80's and not 70's. You will not regret it. Speaking for SPA, we hope to see you in 2015. 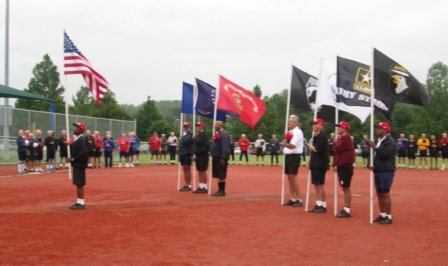 SHELBYVILLE, INDIANA – Senior Softball's longest running MID-WEST tournament, the HOOSIER CLASSIC celebrated its 19th consecutive year entertaining thirty-three teams July 15-20 at SHELBYVILLE'S BLUE RIVER PARK. “DWAINE LAIRD started this tournament years ago and today ED WEST along with GEORGE LANE and R.C.BROWN have continued to make the HOOSIER CLASSIC one of the most respected senior softball tournaments not only in SPA but in the entire senior softball program,” HOOKS added. Limited by only having four fields, the 2014 SPA HOOSIER CLASSIC again reached the maximum amount of teams with thirty-three visiting BLUE RIVER PARK. Ten champions were crowned AA/AAA double-elimination event. KENTUCKY team BORROMEOS took home the 50 AAA title edging INDIANA'S CIRCLE CITY PLAYMAKERS 17-16 in the championship game. BLUEGRASS SOFTBALL was the third team in the group. A home state team, ANTIQUE ROADSHOW narrowly held off SIX PACK 22-21 IN THE 55 AAA FINALE. SIX PACK made it to the championship game by slipping by LOUISVILLE OG'S 18-17. It was a CANADIAN HOLIDAY as CAVCO came south of the border to beat INDY FOG 19-13 for the 60 AA crown. The DAYTON LEGENDS rounded out the three-team bracket. The ZEPPELINS won a nail-biter in the 60 AAA GOLD brackets. The ZEP'S held on for a narrow 18-17 over UNIVERSAL SOFTBALL. The KC THUNDER finished third. (BY) GRACE REDEEMED beat THE BOMB SQUAD twice (33-19, 20-19) to finish on top of the podium in the 60 AAA SILVER BRACKET. SYLVANIA, OHIO'S MAUMEE BAY RAPTORS was the third team in the group. JIM & JOE'S went 3-0 beating the INDIANA LEGENDS 15-7, KENTUCKIANA 16-12 and the INDIANA LEGENDS again, this time 28-12 to win the 65 AA BRACKET. US JOBS kept the 65 AAA title in the home state beating DOC MARTENS 16-13 in the title game. Leading up to the finale, US JOBS had a pair of close calls edging DOC MARTENS 22-21 and MID STATES SENIORS 18-17. Five teams went after the bacon in the 70 AA BRACKET and when the dust had cleared, CENTRAL OHIO COSSA stood at the top of the heap. COSSA beat MID STATE SRS 15-9 and JOB CENTRAL 24-18 before disposing of SENIOR RED BIRDS 26-18 in the championship game. The other team in the field was the COLUMBUS SILVER STICKS. The INDY CROWNS ran the table beating CHICAGO GEEZERS 23-17, PFEIFFERS AUTO 30-29 and PFEIFFERS AUTO again (21-20) for the 75 AAA GOLD title. PRO HEALTH CARE rounded out the bracket. The LOUISVILLE THUNDER downed the SILVER FOXES (22-6) and the MICGIGAN LAKERS twice by scores of 14-13 and 24-15 for the 75 AAA SILVER CHAMPIONSHIP. The seven team tour out for the 75's DIVISION championship was the third highest gathering of 75's in any senior softball tournament, regardless of the organization, east of Vegas. Only THEE BUCKEYE CLASSIC and the SPA 75's WORLDS had more. DALTON, GEORGIA – What a difference a year makes. After going 1-2 in the SPA 55 MAJOR WORLDS in 2013, DOCS came up with a new prescription for success and ran the table at the this year's SPA WORLDS to take the 2014 55 MAJOR CHAMPIONSHIP. The tournament held JULY 17-20 at HERITAGE POINT PARK in DALTON, GEORGIA saw DOCS with the exception of a tight 29-28 win over SWEET CONSTRUCTION in the second round easily roll to the 55 MAJOR TITLE. That fact is easily solidified by the fact DOCS using all 15 players on the roster had an actual team batting average of .750. In all games pool and bracket with the exclusion of a forfeit win, they outscored the opposition 132-89. In bracket play they averaged 29 runs a game to their three opponents' 15 run total. After their 29-28 win over SWEET, they easily disposed of HIGH STREET BUCS 27-9, S.A. 55 SOFTBALL (15-0 FORFEIT) and SWEET CONSTRUCTION again, this time in the title game 31-9. This has also been a good year on the tournament trail for DOCS as they have added titles from the BRICKYARD, SMOKEY MOUNTAIN, DAYTON and COLUMBUS,OHIO in addition to their first SPA WORLD TITLE at DALTON. DOCS sponsor is a DOC (what a surprise). Chiropractors KEN SCHONE and LYNN RINGHEISER have not only been taking care of the team financially but also in the office. The team was originally SCHONES when they started as a 50's team in 2005 and today, almost ten years later, still consider softball a way of life. INBODEN also mentioned his team is starting to get close to social security age with three-quarters of the squad past the age of 60 years, but he isn't concerned. Five of those teammates came in for special recognition at DALTON. CLIFF CARPENTER was honored as the TOURNAMENT MVP. All the second baseman did was compile a team high .945 batting average. Being selected to the ALL-AMERICAN team were REX HICKS (3B,,844), GARY PERKINS )P, .824), TEDDY WEINGARTNER (DH/C, .830), KEVIN FARKAS (1B, .834) and CARPENTER. Other members of the new SPA 55 MAJOR CHAMPS are: INBODEN , LARRY MCELROY, DAVE SCHERVISH , MIKE SULLIVAN , BOBBY WALKER , ROB HAUKE , DAVID MILLER, JEFF BAUMGARDNER , BRAD WARNER and DOUG SHANYFELT. The LADIES who were leading the cheers at DALTON were JUDY HICKS, JENNY MILLER, AMY CARPENTER, JUDY WARNER, JERI WEINGARTNER, JENNY PERKINS, MARY BAUMGARDNER, BETTY SULLIVAN and SUSAN INBODEN. “She is fantastic,” he said. As for 2015, the program has not been set. 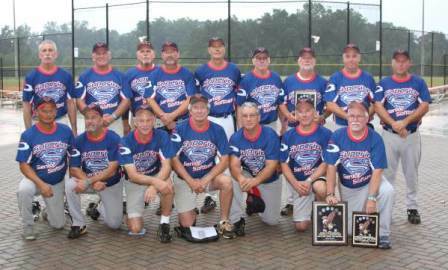 DALTON, GEORGIA – Move over NEW YORK YANKEES 1927 MURDER”S ROW, there is a new powerhouse line-up on the block and it belongs to the 60 MAJOR PLUS SUPERIOR SENIOR SOFTBALL TEAM. The VIRGINIA team made shambles of the competition at the SPA DALTON WORLDS July 17-20 outscoring the opposition 127-69 in four games while also compiling a .821.team batting average. In the championship game 37-18 win over last year's 60 MAJOR CHAMP. MINNESOTA MASTERS WHITE, they pounded out 49 hits of which only five traveled over the fence. In their four games SSS downed HOLLIS APPRAISALS 35-29, MINNESOTA WHITE 29-11, HOLLIS 26-11 and MINNESOTA 37-18. Of course winning has been the norm for the team in 2014. 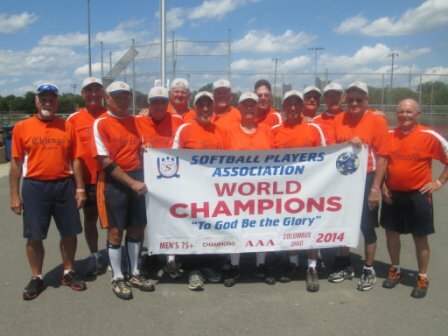 So far in 2014 the 60'S MAJOR PLUS team has won eight tournaments and their counterparts the 65 MAJOR PLUS HAMEL BUILDERS SUPERIOR SENIOR SOFTBALL TEAM has captured three. Since changing names from TURN TWO/SPICER two years ago they have won FIVEWORLDS and NINENATIONALS. You won't find the names of RUTH, GEHRIG, MUESAL and LAZZEREI on this new MURDERS' ROW but there are a few names which are familiar to senior softball fans. Sprinkled through the line-up are SIX IMPACT PLAYERS: DANNY BALLARD (70), DON CLATTERBOUGH (65), JOHN DAVIDE (65), TOMDOMMEL,SR (65), TOMTUDOR (65) and PETE SMITH (65). The rest of the roster are no slouches either. The tournament MVP was short stop HAL HARRISON. HARRISON more than capably filled in for the injured TOMDOMMEL,SR defensively and at bat went 14-for-14. Joining HARRISON in receiving ALL-AMERICAN status were BALLARD (1B,.833), BILL CAMERON (P/1B, .882), CLATTERBOUGH (C,.823), DAVIDE (2b, .938) and DENNIS TUCK (3B, .938). The rest of the “powerhouse outfit” are: TOMMALVICH (OF,.867),CLARENCE ELLISON (1B, .647), JOHN SCRUGGS (2B,.600), RANDY THOMAS (OF, .818),RAY WIMBROUGH (P, .846), GENO BANDY (OF, .800), RONNIE COLLINS (DNP), VANCE GUDMUNDSON (DNP), DOMMEL (DNP), PETE SMITH (1B, .846), MIKE GOODMAN (OF/INF, DNP) and DEWEY FUSSELL (P,.545). Non-roster support was given by statistician ROSSI DODSON and equipment manager WESLEYWALDEN. (MIKE) GOODMAN in addition to his contributions on the field also is a big reason the team can make it without a full time sponsor. SEARS emphatically claimed the teams biggest support comes from the wives. Like most MAJOR PLUS and even MAJOR teams/ SUPERIOR SENIOR SOFTBALL does feel the financial pinch. “I would expect the only time we will be able to play 60-MAJOR teams is when we are 90-years old and we will probably have to spot them seven runs,” he added. Of course you can always break up the team and scatter the players, right? SEARS said he did hear there was a possibility SPA may be holding a couple of MAJOR and MAJOR PLUS only regional tournaments in the east and mid-west in 2015. 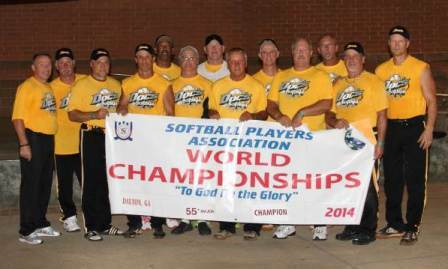 DALTON, GEORGIA – JIM FERGUSON and his RATED ATHLETICS 50 MAJOR softball team added a new twist to HORACE GREELEY'S famous quote, “Go WEST young man, Go West...” to find fame. 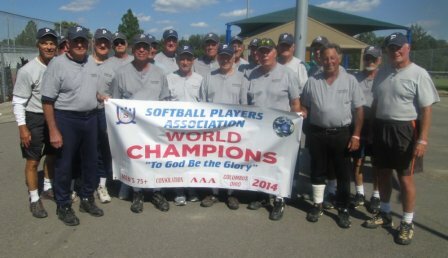 FERGUSON and his gang instead went EAST and ended up winning their first ever WORLD SENIOR SOFTBALL CHAMPIONSHIP, the SPA 50 MAJOR WORLDS in DALTON, GEORGIA JULY 17-20. The RATED ATHLETICS team made the move to SPA two years ago when FERGUSON said the other organization they played with unfairly (in his opinion) moved the team to MAJOR PLUS. Apparently FERGUSON was correct about his team because at the DALTON WORLDS in 2013, they went 2-and-2 and gone. But that was then and this is now and the result is a WORLD TITLE. It didn't start off that great as the RATED ATHLETIC lost its first pool game to MONSTER SOFTBALL 12-11 before winning the second game 34-33 over the ATLANTA MONARCHS. After that it was , “KATIE BAR THE DOOR” as the CALIFORNIANS knocked off HERRINGTON SERVICES (27-12) and the number one seed MONSTER SOFTBALL (26-8). That was followed by a 34-11 thumping of LIGHTHOUSE LOOKOUTS and the GOOD TIMES 20-15. The party ended shortly thereafter when GOOD TIMES came out of the losers bracket to force an “IF” game with a 42-30 win. For the “IF” game, FERGUSON and the others decided to try a new strategy. They went with three outfielders, over loaded one side and had TOURNAMENT MVP PITCHER FREDDIE RIVAS pitch the ball flat and inside. The strategy worked as the home team RATED ATHLETICS won the “IF” game 30-25. ALL-AMERICAN second baseman RUDY RAGADIO carried the big stick in the title game with a pair of grand slam homers. RIVAS, who won all five bracket games also batted .848 for the tournament with six homers. Defensively, after he pitches he drops back to second base giving the team another additional infielder. Joining RIVAS and RAGADIO (.636) in the gold glove and ALL-AMERICAN parade was third baseman CLIFF “COWBOY” MCLAUGHLIN (.666) , a professional stunt man. Others receiving ALL-AMERICAN recognition were K.T. THOMPSON (CF), SS GREG BOVERO and R.J. JOHNSON. JOHNSON batted .757 with six round trippers. THOMPSON was at .692 with eight home runs while BOVERO in addition to hitting .692 sparkled on defense throughout the tournament. Of course you don't win a tournament with just a few All-STARS, you need a whole team of them. Others on the team are: RON CHENIER (RF,.714), BARRY MORTON (p,2-0), FERGUSON (LF, .769, 9 HR'S), KEN HILL (,652, 5 HR'S, MGR), RAMON RUELAS (2B/OF, INJURED), the team “ROOKIE”,CARLOS RIVERA (.577, 4 hr's), SCOTT “MR. INTENSITY” CAMERY (.657) and CHRIS YAP, pinch hitter extraordinary who went 7-for-7 in that role. One of the biggest assets to the team is catcher ARNIE VICE. VICE not only shines on the field with his .720 average and 7 home runs but also off the field. VICE is the owner of the RATED ATHLETICS sports outlet which is the team sponsor. He isn't the only “VICE” the team has either. ARNIE's wife EVE is like the team's traveling secretary taking care of all the travel plans and such. With her help the team was able to rent cabins in the backwoods of DALTON, where they relaxed fishing, swimming and partying. Joining EVE as the team's chief cooks and special cheerleaders were wives PAULA FERGUSON. AILICIA RUELAS and KAREN MCLAUGHLIN. 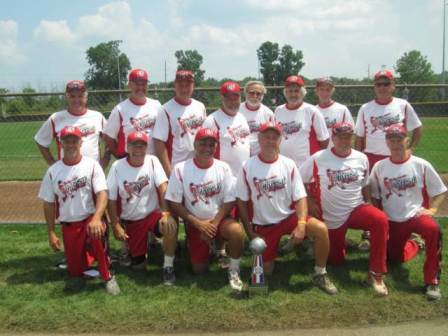 SYLVANIA, OHIO – The SPA 2014 SYLVANIA GREAT LAKES NIT TOURNAMENT continues to carry a “SUPERIOR RATING” as far as senior softball teams are concerned. The fourth year of the GREAT LAKES event, held at OHIO'S SYLVANIA, RECREATION'S PACESETTER PARK JULY 31-AUGUST 3, saw an increase in participation with FORTY-ONE TEAMS participating in the seven divisional brackets. It was the third growth year in a row for one of SPA'S most popular tournaments. The tournament's largest group, the 60 AAA, saw eight teams battle for the championship with UNIVERSAL SOFTBALL beating the “home town” MAUMEE BAY RAPTORS twice for the title. The COLUMBUS team won 24-16 in the title match and 23-22 in an earlier bracket game. UNIVERSAL also beat CARR'S SHELL 25-10 and MINUTEMEN/PEPCO 16-10. The RAPTORS reached the title game by beating CHICAGO PRIME 17-6. The other teams in the bracket were THE BOMB SQUAD, PRONIO SPORTS and OHIO SILVERADO'S. The EIGHT teams in the 65 AAA DIVISION was the fifth highest entry total of any senior softball tournament east of VEGAS. The GREAT LAKES also had the second highest total of attendees in the 70 AA and 70 AAA, ranking only behind THEE BUCKEYE CLASSIC for all tournaments to date in senior softball east of VEGAS. The 70 AAA DIVISION went to another COLUMBUS team as CENTRAL OHIO COSSA defeated MICHIANA MERCHANTS 17-14 in an “IF” game. The winners had forced the “showdown game” by beating MICHIANA 19-12 which also avenged an earlier 23-15 defeat at the hands of the team from ”UP NORTH”. COSSA also had the distinction of playing the most games in the tournament They lost their second bracket game and had to fight their way out of the loser's bracket which forced them to play seven games to win it all. COSSA'S other wins were 13-7 over JOB CENTRAL, 16-15 over BRANTFORD NISSAN, 8-5 against DORCHESTER CANADIANS and PITTSBURGH GOLD 21-16. AKRON BRENNANS was the other team in the seven-team bracket. In the six-team 70 AA bracket the DAYTON LEGENDS edged FRICKER'S SPORTS BAR SYLVANIA 19-18 for the title. The DAYTON squad beat CHICAGO GREY SOX (15-0) and MISSISSAUGA LEGENDS 11-7 on the way to the crown. FRICKERS beat CHICAGO (15-0) and MISSISSAUGA (16-12) to earn their spot in the finals. Others in the field were OLDE D'S and INDIANAPOLIS CLASSICS. The four-team 60 AA title went to BRANTFORD NISSAN who swept bracket play beating MISSISSAUGA LEGENDS (22-13), CAVCO (19-15) and DAYTON (24-10). MISSISSAUGA made the finals by edging CAVCO 24-23. The HAWKS NEST took no prisoners in easily going 4-0 in the six-team 65 AAA group. The PENNSYLVANIA team beat BRANTFORD NISSAN 21-14 in the finals after beating NEW JERSEY MASTERS 28-17, RUSH TRUCKING 27-16 and MICHIGAN LAKERS 32-21 in earlier games. BRANTFORD beat the NEW JERSEY MASTERS 26-25 to make it to the title game. SYLVANIA 65's rounded out the field. The WINDSOR CHIEFS 55's added an INTERNATIONAL flavor to the awards celebrations as the CANADIAN team nipped the GOLDEN VIPERS 20-19 for the five-team 55's DIVISION top spot. The CHIEFS also beat BANKER AND MANN SOFTBALL 18-12 and the VIPERS 21-6 to go 3-0 in bracket play. The VIPERS made it to the finals by beating BANKER AND MANN SOFTBALL 19-10. Others in the bracket were BSN and ALL SHRED/PACESETTER MANAGEMENT PROPERTIES. PDC also went undefeated in bracket play (3-0) to take home the top prize in the 50'S five-team group. The champs beat DAYTON LEGENDS HITMEN 26-25, JJ FINANCIAL EAGLES 23-15 and DAYTON LEGENDS HITMEN (earlier game) 21-18. DAYTON slid by JJ FINANCIAL 18-17 to earn their spot in the finals. Others in the field were SYLVANIA EAGLES and WINDSOR FOG. 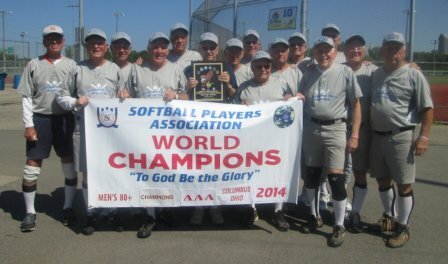 SYLVANIA, OHIO – Sylvania, Ohio has become one of the fastest growing success stories in not only SPA but in all of senior softball. In eight years the SYLVANIA SENIOR SOFTBALL LEAGUE has grown from one ten team league to two leagues with twenty teams and nearly 300 participants from age 50 up. In addition, the four-year old SPA SYLVANIA GREAT LAKES NIT CLASSIC, spearheaded by members from the SYLVANIA organization, is now in the top sixteen attended senior softball tournaments among all SPA, SSUSA and ISSA senior tournaments east of Las Vegas. Although he won't take all the credit he deserves, JERRY KEEFE has been the major moving factor in both. Most of the original members of the League came from the East Toledo organization and really weren't happy with the ETO. Borrowing on his marketing skills as MARKETING DIRECTOR for TOLEDO JEWELERS, KEEFE organized a marketing plan that would make any organization proud. Using a newspaper blitz in all papers within a FIFTY-MILES radius, he promoted and advertised for senior softball players. He then devised a mailing list using names of former players from rec leagues the quartet knew and topped it off with a phone blitz. “Reaching potential customers, advertising the product and then selling it is the secret to any marketing plan and it really worked well for us,” KEEFE said. Another major factor in getting the league going and keeping it growing in popularity since 2008 has been sponsors. “We couldn't keep our price per player down without sponsors,” KEEFE stated,”Without them it would cost players over $100 to sign-up in the League as opposed to the $70 we now receive”. “The sponsors take care of the team shirts and hats and the league's biggest expense then are the field rentals and year-end awards. Members of all the league championship teams receive jackets and we also have additional individual awards at the Leagues Awards and Recognition Banquets,” he explained. Foremost among the sponsors is FRICKERS SPORTS BAR in SYLVANIA. 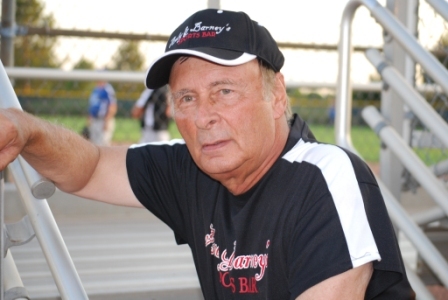 Owner RAY FRICK sponsors six teams in the twenty-team league. He also backs the 70'S FRICKERS SPORTS BAR travel team and is constantly contributing additional money to the organizations operation. Speaking of tournament teams, there are travel teams in the 50, 55, 60, 65 and 70 teams from the SYLVANIA league. Attending SPA tournaments in BARBERTON and COLUMBUS also gave KEEFE the idea to have a senior tournament in SYLVANIA. HOOKS flew to SYLVANIA in JULY to meet with KEEFE and PACESETTERS ROB CONOVER about SYLVANIA hosting a tournament. He followed that up with another meeting in DECEMBER and shortly thereafter the SYLVANIA GREAT LAKES NIT was born. KEEFE and the SYLVANIA tournament might have needed help at the start but now they are not only running on their own, but also helping other SPA tournaments directors. In his marketing mailer about the SYLVANIA tournament, KEEFE also promotes THEE BUCKEYE CLASSIC, COLUMBUS and other area SPA tournaments. The SYLVANIA League also has one of the best marketing tools in senior softball with their own web page at sylvaniaseniorsoftball.com. Lots of interesting articles, player profiles, current news and archives. However, it also has one of the best photo shoots in any senior web site. JOEL HANSON does a fantastic job with his pics on teams, individuals, sponsors, awards and such. Surprisingly, the one thing KEEFE is most proud of is not the tournament or the league but rather a special event put on by SYLVANIA LEAGUE COMMISIONER JAY SCHRAMM and members of the SYLVANIA SENIOR SOFTBALL LEAGUE. In MAY, SCHRAMM along with the league organization raised over $30,000 for the WOUNDED WARRIORS PROJECTS. It was done mainly through a triple header softball event featuring WOUNDED WARRIORS, SYLVANIA POLICE. SYLVANIA FIREMEN and SYLVANIA LEAGUE players among others. There was also a number of other fund raisers and activities. KEEFE and SCHRAMM both agree there should be more to senior softball then just wins and losses. And you really couldn't ask for more.